A busted water main flooded streets and interrupted subway service near Greenwich Village in New York City on Wednesday. The fire department and water crews are responding. The cause of the broken water main is unclear at this point, but the fire department said it's possible that a Con Edison utility crew accidentally struck the water pipe. The incident resulted in a downpour of water at the 14th Street station, where the 1, 2 and 3 trains stop. Videos posted online show one subway car stuck on the rails as water cascades down its sides, with people still sitting inside. The fire department told DNAinfo that there have been no reports of people still inside the station, though some 500 people had to be evacuated. 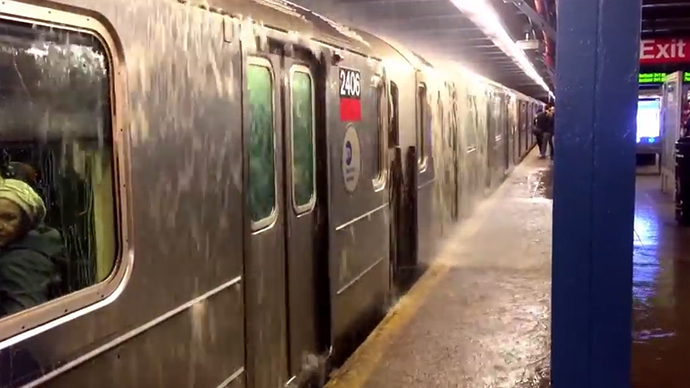 Another video shows so much water falling onto the tracks that a pool is formed almost as high as the subway platform. According to amNewYork, power has been cut to the train tracks and service has been diverted. The trains are still running, but with significant delays, and none are stopping at 14th Street. Meanwhile, the flood of water ended up above ground on the streets as well. Some roads have been shut down, NBC 4 stated.